Palmyra is like a pearl in the heart of the Syrian desert. Rising from the sands, the surviving pillars of its Great Colonnade march off into the distant desert haze like some well-drilled army. This ancient, long-abandoned Roman city is one of the most graceful and splendid ancient sites in the East, for the glory and the greatness tell of a heroic history during the reign of warrior Queen Zenobia. 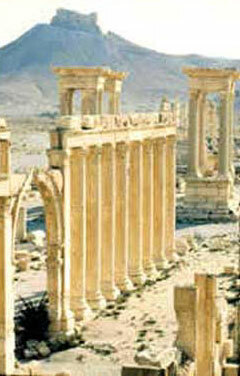 Palmyra is separated by approximately one hundred kilometers from the lush valley of the Orontes, to the west. There are more than two hundred kilometers of desert to cross before you reach the fertile banks of the Euphrates to the east. From both north and south there is nothing but sand and stone. But here at Palmyra a spring rises out of a long underground channel whose depth has never been measured. This spring is called Afqa (or Ephka), an Aramaic word meaning, “way out.” Its clear blue, slightly sulphurous waters are said to have medicinal properties, and they have fed an oasis here with olives, date palms, cotton and cereals. In 217 the Emperor Caracalla proclaimed Palmyra a "Roman colony," a popular move amongst the merchants of the city for it freed them from taxes. Spices, perfumes, ivory and silks from the East, glass statues, and objects of art from Phoenicia, all passed through Palmyra, making it one of the greatest cities of the Roman Empire. Luxury came to Palmyra and magistrates, merchants, and citizens whom the city wished to honor, had their statues erected and inscribed on consoles along the innumerable columns that lined the streets. The Grand Colonnade was extended eastwards and, at the same time another was built, at an angle to it, leading to the Temple of Bel. In the valley of the Tombs, to the east of the city, the "houses of the dead," veritable underground palaces, were decorated with particularly fine sculpture and frescoes. Impelled by an influential Arab family, Palmyra passed, in two or three stages, from being a merchant republic governed by a senate, to being a kingdom under Odenathus the Younger who awarded himself the title of "King of Kings." To be sure, his brilliant military actions had earned him the gratitude of Rome: the Palmyrene armies had twice defeated the Persian armies and, in 267 the Senate of Rome named him the "Corrector of the East" in return. The authority of Palmyra seemed destined to extend over a vast territory. But at the end of 267, Odenathus was assassinated under mysterious circumstances. Rumor had it that Zenobia, the king’s second wife and mother of a very young son, was in some way involved in the crime. In fact, the queen immediately revealed herself to be an exceptionally able monarch. She was boundlessly ambitious for herself, for her son and for her people. Zenobia ruled Palmyra in a way that astonished both West and East. She was exceptionally intelligent and attractive. Within six years she had affected the whole life of Palmyra. But her dreams of unattainable glory and greatness soon brought ill fortune, ruin and death to the flourishing city. In 270, the Queen, who claimed to be descended from Cleopatra, took possession of the whole of Syria, conquered Lower Egypt and sent her armies across Asia Minor as far as the Bosphorus. She took the title of “August,” which was only used by the emperor of Rome, and she had money coined with her and her son’s likeness upon it, without that of the Roman emperor. In open defiance of Rome, Zenobia and her son set themselves up as rivals to Aurelian who was at that time having difficulties on the German borders of the Empire. They had acted rashly and too hastily, and Emperor Aurelian took quick action and started to plan his revenge on Queen Zenobia. Aurelian disengaged from the northern front, raised a new army, crossed Anatolia, hustled the Palmyrians out of their positions at Antioch and Emesa (Homs) and made straight for Palmyra, which fell after a few weeks siege. Zenobia managed to escape and fled east, mounted on a dromedary, hoping for help from the Sassanids. The Romans recaptured her as she was crossing the Euphrates (in the autumn of 272). Zenobia was taken prisoner to Rome, where she starved herself to death, but not before she learned that a last bloody revolt by her subjects against their Roman rulers had been put down, and that her splendid wealthy city had been pillaged and was due to be destroyed (273). Palmyra was reduced from being a capital to a mere Syrian frontier stronghold. New walls were built, smaller than those in Zenobia’s time, and under Diocletian (293-303), the Romans established a military camp to the west of the city, apparently on the site of the palace of Odenathus and Zenobia, which is said to have been demolished and of which archaeologists have so far discovered no trace. Palmyra never recovered her position. Aleppo, during the Byzantine period, and then Damascus, after 634, from the beginning of the Islamic period, became, in their respective ways, equally important as centers of commerce and ideas. The temples of Palmyra were converted first into churches then into mosques. In the 12th century the walls around the shrine of Bel itself were adapted for use as a fortress. At the beginning of the 17th century, the Emir Fakhr ad-Din was still using Palmyra as a place to exercise his police, however he was anxious to have greater security than offered by the ruined city, so he had a castle built on the hillside overlooking it. Down below, the ruins soon sheltered only a few peasants. In 1751 two English travelers in the course of a long and difficult journey around the Orient visited Palmyra. They brought back books of sketches, which astounded the contemporary artistic and scientific world. The elegant and mysterious Palmyrene script was deciphered soon afterwards. However, it was not until eighteen centuries after the dramatic end of the Arab Queen Zenobia’s reign that Palmyra finally re-emerged from oblivion. Queen Zenobia’s ambitious dream is still embodied in the magnificent remains of what she built. The Palmyra ruins, which covers an area of 6 square kilometers seem to spring back to life as the setting sun paints its ruins a pinkish-orange, and in the Valley of the Tombs, burial towers leap from the desert like mysterious ancient warriors.